Skin Cancer: A Subtle Sign Of Climate Change - Elias and Williams: The Inside-Out of Skin by dermatologists and skin researchers Peter M. Elias, M.D. and Mary L. Williams, M.D. A patch of daffodils in full bloom on the Sonoma California coast in late January 2019. A shift towards an earlier spring is one of the subtle, but very important signs of climate change. An increased incidence of skin cancers is a health consequence that will only appear after many years, because of the long time lag between the injury to the skin and the development of a cancer. Amidst the drumbeats last Fall, which seemed to bring nothing but bad news about our changing climate and its perils to human health, came one small ray of hope. A new study out of Yale University demonstrated that nearly 3/4ths of American now believe in climate change. Not surprisingly, it was the calamitous effects of extreme weather events – the floods and the forest fires, for example – that largely accounted for this new wave of understanding. Such environmental catastrophes are the big red flags of climate change – and, of course, we need to pay attention to them. But there are also quieter, more subtle signs of our changing world that are equally portentous. During a recent break in our winter rains, I seized the opportunity to take a walk along a coastal bluff about 80 miles north of San Francisco. Taking a spur off the main trail, I was surprised to come upon a field of daffodils, as I rounded the bend. They lay near what appeared to be the remains of the foundation of a small building – perhaps an old sheepherder’s hut from an earlier time. The daffodils may have been planted by someone who hoped to tame and humanize an otherwise bleak and wind torn landscape. Though long abandoned by humans, the flowers had carried on, undisturbed by grazing deer – growing, blooming, and withering in annual cycles, year after year, for decade after decade, thereafter. Just as a choking blanket of smoke last Fall brought home to many Californians the realization that climate change was the real arsonist behind those terrifying forest fires — so too, did the sighting of a beautiful patch of daffodils, blooming ‘out of season’, remind me that the hand of the demon of climate change is everywhere, operating at every level. It was not until I returned home that I began to consider how odd this sighting truly was. For only then did I recall how – when I first moved to the Bay Area some 40 years earlier – I looked forward each winter to visiting Carmel – a much-loved village lying along Monterey Bay, about 100 miles south of San Francisco – and witnessing the arrival of Spring to its charming gardens. We would escape to Carmel for a scientific meeting that was always held during the first or second week of February. Seeing daffodils blooming there, we knew their flowering would extend up to San Francisco in a few more weeks. Spring, we could see, was indeed on its way. Here is what was shocking to me that afternoon, as I reflected on those early days in California. This daffodil patch I had chanced upon was blooming at least a month earlier than it should have been! Most likely I hadn’t noticed that spring is coming earlier now to my region, because the year-to-year changes were such small, incremental steps. It took memories from decades earlier to shock me into recognition of how climate change was affecting my landscape – just like it has taken floods, violent hurricanes and wildfires to shock the American public into recognize its presence. Indeed, the timing of seasonal phenomena in plants relative to climate – has shifted 2-3 days on average each decade or so towards an earlier spring over the last 40-50 years . 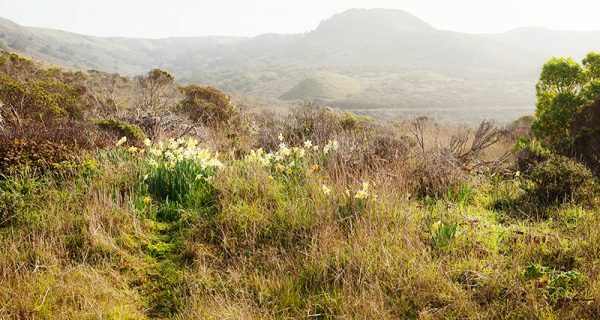 While this shift on average would predict these daffodils might bloom ~1-2 weeks earlier than they had 40 years ago, given a substantial variability in the timing shifts among different species, a 3 to 4 weeks advance in the blooming season for these coastal daffodils was quite possible. Other effects of climate change – including some of its effects on our health – may also accrue so slowly, that if we are not vigilant, they could escape our notice. One of these slowly accruing effects has the dermatologic community particularly concerned. That is the likelihood that climate change will increase the numbers of skin cancers in our population. Because most skin cancers arise only later in life, and after many years of sun exposure, the impacts of climate change on these common, and sometimes deadly, cancers may not be immediately apparent. The primary environmental cause of skin cancer is exposure to sunlight. The sunburning rays of sunlight (UV-B) can directly damage the DNA of skin cells. Overtime this DNA damage accumulates, and skin cancers can result. Longer-wave ultraviolet rays (UV-A) are less directly damaging to DNA, but they can generate free radicals (‘reactive oxygen species’ or ROS) that can also damage DNA. On warm, sunny days, people, and especially children, spend more time outdoors. Heat Is A Factor, Too. Many of us consider the likelihood of getting a sunburn only when it’s hot outdoors and the sun is shining brightly, but this is, of course, not true. Sunburns can certainly develop even on cool and cloudy days. Yet, there is a kernel of truth behind this notion. In animal models, for example, the cancer-inducing effects of UV light increase by 5% for each degree centigrade of increased temperature. Warmer summers caused by global warming, therefore, are likely to lead to more hours of sun exposure and in hotter sunlight that is more carcinogenic. The effects of air pollution are another climate-change-related ‘wild card’ that when played will likely result in more skin cancers. This can work in a couple of ways, but the key concept here is ‘ozone’. Keep in mind that there are two types of ozone, both of which will impact the incidence of skin cancer. You can think of them as the ‘good’ ozone vs. the ‘bad’ ozone. The ‘good ozone’ is the one we have been hearing about for quite some years. This is the blanket of ozone in the outer layer of our atmosphere that screens out much of the shorter and highly energetic wavelengths of UV light emanating from the sun, including lots of UV-B. This ozone blanket – the ‘stratospheric ozone’ – is our first defense against damaging rays of sunlight. But, unfortunately, holes in the blanket have developed during recent decades due to the release of (read ‘pollution by’) aerosols and refrigerants containing chlorofluorocarbons (CFCs) into the atmosphere. By reducing the protective, ‘good’ ozone layer, these pollutants have contributed to the current, worldwide epidemic of UV-induced skin cancers. While these particular compounds have been banned internationally for the past 40 years, and despite the evidence that the holes in our atmospheric ozone blanket have now at least stabilized in size, it will be ~2060 before the ozone layer has been fully restored. In the interim, damaging UV rays will continue to leak through the atmospheric ozone holes and will induce more skin cancers that will only appear decades later. ‘Bad’ ozone is something of a newcomer to our awareness. This type of ozone is generated in the lower atmosphere, and can be present in the air that we breathe and that bathes our skin. This ground – or ‘tropospheric’ – ozone comes from the pollution produced by burning fossil fuels – in our factories, homes and automobiles. Ground ozone is generated through the action of heat and ultraviolet light on these pollutants. As the globe warms and as we continue to combust fossil fuels, increased air pollution with ozone will be one of the consequences climate change. Ozone is a particularly damaging form of air pollution. Ozone reacts with organic materials to generate peroxides and other ROS (reactive oxygen species) that can damage cell membranes and nuclear DNA. The immediate effects of increased ozone air pollution are predicted to include more acute respiratory illnesses, like asthma attacks. But in the long term, this climate-induced pollution will also likely contribute to the ever widening epidemic of skin cancers. Ozone is also a pollutant that has recently been linked to other skin problems, such as eczema and skin aging. In sum, climate change will result in more skin cancers. Warmer climates will attract people to spend more hours outdoors and exposed them to more damaging rays of sunlight. Warmer temperatures will also make the same rays of sunlight more carcerous. In addition, some forms of air pollution damage the stratospheric ozone layer, and allow more cancer-causing UV light to reach the earth, while others will generate ground-level ozone, which is also promotes skin cancer. Like the slow and subtle shifting of spring flowerings to earlier and earlier dates on the calendar, these climatic effects on the causation of skin cancers will only appear slowly and only after a long delay. To protect our skin health of the future, we must take steps now to curb our use of fossil fuels. We need to curtail emissions of these environmental pollutants, and, most importantly protect our skin from UV light. In a future post, we’ll talk about sun protection and how you can maintain good skin health, still enjoy outdoor activities and keep your sun-safety practices environmentally-sensitive.